Visit the first and second tiers of the Colosseum and learn its secret history. Skip the lines at the Colosseum, Roman Forum and Palatine Hill. Stroll through history at the Roman Forum, stopping at famous sights. See the famous sites in central Rome like the Trevi Fountain & Spanish Steps. Indulge in a delicious gelato – Italy’s answer to ice cream. Step into the Pantheon and learn choice morsels from the 1,900 year history. Experience the Vatican Museums and the Sistine Chapel at night; just like the Pope himself. Enjoy the Museums without the crushing. Discover Vatican City’s crown jewels—the Vatican museums and the Sistine Chapel—in peace. The ultimate single-day Rome experience, visiting all the top sites in a single day. Enter the Colosseum with all-inclusive skip-the-line tickets. See the top sights of Rome’s historical centre, incl the 2,000 year-old Pantheon & more. Wander the fully-preserved streets of Pompeii on a guided tour. View the death casts of people caught in the eruption and peek into shops, temples. Enjoy a stunning drive along the Amalfi Coast with a stop for lunch (or shopping). Explore the three underground levels of the Basilica of San Clemente. See homes as old as the first century BC buried under the surface. Wander along underground roads, see the ruins of the buildings of Imperial Rome. Enter the Sistine Chapel before the general public.. Skip the long lines in front of St. Enjoy comprehensive introductions to both the Sistine Chapel and St. Throw a coin in the Trevi Fountain.. Explore the characterful streets of the Trastevere and Tiber Island..
See the landmark attractions of central Rome by bike.. Highly Recommended!! Reviewed Tour: Rome By Night: On Pizza and a Bike!! “Had a great time cycling around the cobbled streets of Rome with our extremely helpful guide! As long as you manage to avoid the people it’s great fun and you get to see all the main sights of Rome in the evening setting sun. Beautiful. Pizza at the end in a lovely (very popular) restaurant was delicious. “We had never done a bike tour of a city ... and it's a fantastic experience. It helps you to know where everything is and to take a quick look at everything there is to see... The route is about 12 km... but as you stop and listen to what Caterina explains you don’t get tired. Holidays in Rome are a chance to soak up the wonders of a culturally vibrant city in Europe. Brimming with awe-inspiring ancient ruins, Renaissance-era masterpieces, as well as a sea of chic eateries and buzzing cafés, a trip to Rome will not only be a feast the eyes and the mind, but also for the palate. The Eternal City’s ancient monuments dating to the Roman Empire are well-preserved and plentiful. Some of the most visited ones include the iconic Colosseum, Arch of Constantine, the Pantheon and Palatine Hills. Vatican City, a independent papal state within the city Rome, is home to several landmarks of the Italian capital, such as St. Peter’s Basilica, Vatican Museums and the Sistine Chapel. 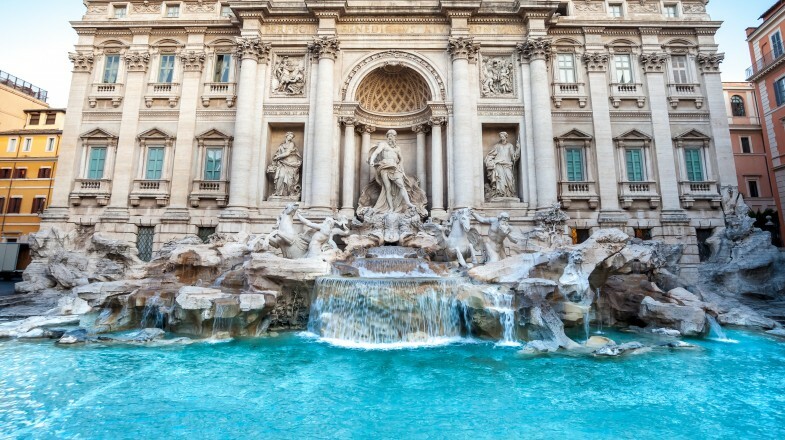 Trevi Fountain is one of the most opulent and famous fountains in the world. It is said that, if you wish to return to Rome, you should toss a coin with your right hand over the left shoulder in its basin. The Spanish Steps, which connect Piazza di Spagna with Piazza Trinità dei Monti, are one of the most recognizable symbols of Rome and a bustling meeting spot for the locals. If you find yourself in Rome during the scorching summer months, you can always escape the heat by visiting one of the beaches that can be reached via public transport. Most popular ones include the Santa Marinella, Santa Severa, Ostia and Fregene. To absorb Rome’s atmosphere like a local, head over to the Monti neighborhood, a charming maze of cobbled alleyways and piazzettas, which is also a hub of hip, independent businesses, shops and eateries. Keep in mind that several major Rome attractions have a strict dress code, especially in the Vatican. This means wearing shirts that cover the shoulders and skirts or pants that go below the knee. If you are visiting Rome when the temperatures are high, it might be a good idea to carry a shawl with you, just in case you need to cover up. Rome, (population: 3.8 million), also known as the Eternal City, has been attracting travelers from all parts of the world for more than 2000 years. Considered to be one of the most romantic and magical cities on the planet, Rome offers a seductive mix of bustling city life and old-world charms. Add Italian designers, delicious ice creams and exquisite wines into the picture and you have everything you could possibly need to make your holidays perfect. A fascinating street life, breathtaking art, remnants of an ancient empire, larger-than-life architecture and delicious food – these are just some of the things that Rome has in store for you. Dominating the Vatican, the dome of St. Peters Basilica reminds the world of the pope’s presence while ancient constructions such as the Colosseum, Pantheon and Roman Forum offer insights into the mighty hub of the Great Roman Empire. And that’s just the beginning! From majestic fountains and tasteful city squares to breathtaking art galleries and historic museums, the streets of Rome are also overflowing with art and artifacts made by master artists such as Bernini, Michelangelo, Caravaggio and Raphael. Just visit the Vatican Museums or the Galleria Borghese for insider looks into some of the most exotic artworks on the planet. When in London, choose the underground, but when in Rome, choose nothing! The weather of Rome might be as perfect as it gets, but the public transportation system cannot boast of being as dependable. Moreover, the best way to explore the historic city center is by walking or cycling. If you’re not a big fan of walking, you can choose from buses, trams or taxis. Rome was given the title The Eternal City because Romans believed that Rome would never fall. Although the empire is not exactly what Romans thought it would be, the modern Rome is still every bit as grand as it was back in the day. The Colosseum – The largest remaining Roman-era amphitheater in the world. The Pantheon – A magnificent building that looks exactly like what it was 2000 years ago. Vatican City – Filled with landmarks such as Vatican Museum and St. Peter’s Basilica. Imagine the grandeur of ancient Rome on a guided tour of the Roman forum. Visit Galleria Borghese, which is housed in a beautiful 17th century villa filled with antiquities and art. Look at some of the signature masterpieces of art by Girgio de Chirico at the Girgio de Chirico House Museum. Try some of the classic Italian dishes such as pizza, pasta or gelato in one of the local cafes in the Trastevere Streets. Shop at Via del Governo Vecchio, where you can find everything from the latest Italian designer clothes to classic Italian shoes. Rome is located in the central west part of Italy and has a Mediterranean climate. January is the peak of the winter season and the average temperature during this period is 8 °C. July is the hottest month of the year in Rome when average temperatures climb up to 25 °C. Most of the rainfall occurs in the autumn (October and November) season. Euro is the official currency in Italy. Whether you want to visit the churches, admire the art of various artists from different times, or simply walk through the streets of Rome to soak up the city, you will find that Rome always leaves you enchanted. Bookmundi offers you a variety of top activities and tours in Rome that you can choose from, all supported by our best price guarantee meaning that you can’t find them anywhere else at a lower price!